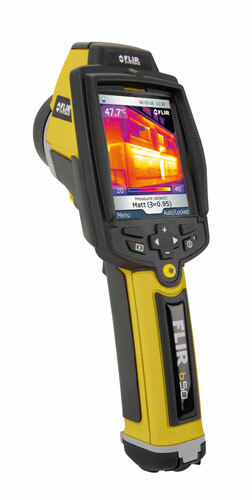 Introducing the latest development from FLIR - the global leader in thermal imaging. The all new FLIR B50 is a truly revolutionary infrared camera at a price you can afford! Now even smaller businesses with tighter budgets can take advantage of the many benefits an infrared camera can have on their bottom lines. The FLIR B50 Infrared Camera will allow you to perform more thorough inspections in less time and with less effort. The FLIR B50 Infrared Camera features scalable picture-in-picture (PIP) that allows you to overlay the infrared image directly onto the corresponding visual image so you can see an infrared image super-imposed in a visible light image. With the instrument's high accuracy of 2% and thermal sensitivity of better than 0.1ºC, you'll have the ability to uncover potential problems faster and easier than ever before. The thumbnail image gallery allows you to recall images to help you build expert reports. The built-in illuminator LED lights give you the ability to work confidently in dark and confined areas. Boasting a temperature range of between -20ºC to +120ºC, the FLIR B50 Infrared Camera has hot and cold color, dewpoint and insulation alarms. The built-in Dew Point Alarm displays areas with risk of surface condensation where mold growth could occur. The areas are visualized as a colored isotherm. The built-in Insulation Alarm easily detects areas that don´t fulfill the insulation requirements. The areas are visualized as a colored isotherm. The FLIR i50 has a visual camera with 2.3 Mp resolution. A function for overlying the infrared image on the visual image while retaining all measurement data. This feature helps to spot and highlight sensitive or dangerous temperature developments and makes report interpretation easy even for a person unfamiliar with infrared. FLIR i40/b40 has a fixed PiP. FLIR i50/b50 has a 3 step PiP and finally FLIR i60/b60 has a fully scalable PiP. All FLIR i-Series cameras have built-in LED lamps that ensure quality visual images regardless of job site lighting levels. A conveniently located button activates the laser locator that will help you associate the hot or cold spot in the IR image with the real physical target in the field. Upload images and measurement findings to USB stick. Spot (center), Area (min/max)and Isotherm (above/below) measurement modes ensure you got the best and most accurate results when on site. FLIR B50 weighs only 600g and is easy to store in a belt pouch. Store up to 5000 images on the included microSD card. Clearly see temperature readings on the Flir b50's large LCD display. Stores images with unique ID in radiometric JPEG format on a standard microSD card. USB file transfer to PC. Invaluable for moisture problems and mold problems! Moisture in building materials can destroy the structural integrity and nurture mold and insect infestation. Infrared cameras can instantly image entire rooms, inspect hard-to-reach places, reveal wet conditions behind surfaces at the source, and then monitor when the area is completely dry. Perfect for finding hot spots! For mechanical equipment, nearly everything gets hot before it fails - making infrared cameras extremely cost-effective and valuable diagnostic tools in many diverse applications.